An unofficial patch is a non-commercial patch for a piece of software, created by a user community instead of the original developer. Similar to an ordinary patch, it alleviates bugs or shortcomings. Unofficial patches do not usually change the intended usage of the software, in contrast to other third-party software adaptions such as mods or cracks. In the computer game domain, where unofficial patches are most common, unofficial patches are also sometimes called Fan patches, especially if produced by an individual person. Combined patches, including the work of several developers and authors from the community, are also called Community Patch. They are aiming typical for critical bugs in the program flow which could lead to program crashes and technical compatibility fixes, e.g. for newer operating systems, increased display resolutions or new display formats. While unofficial patches are most common for the PC platform, they are also existing for console games e.g. in context of the emulation community. As another kind of unofficial patches are fan translations of software, especially games, to local languages. 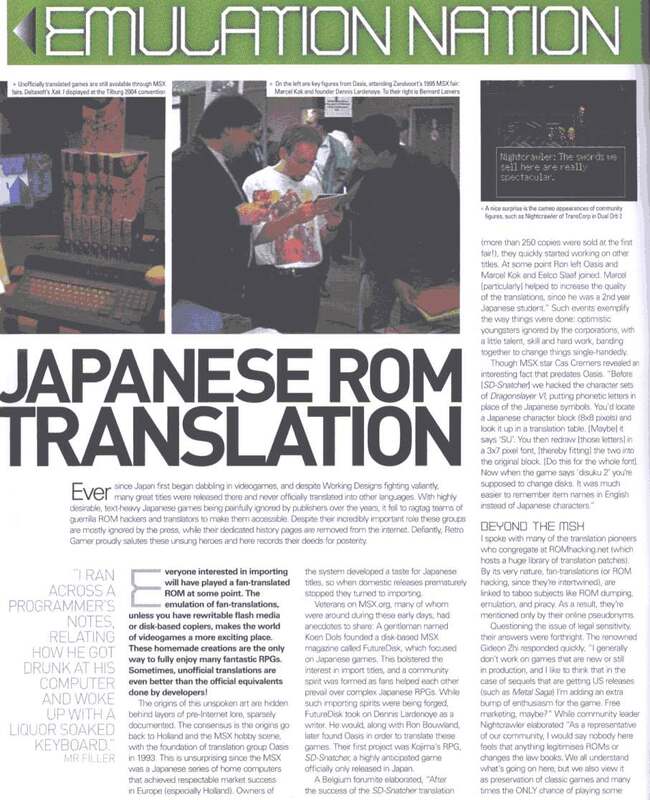 Fan translations are most common for Japanese role-playing games which are often not localized for Western markets. Another variant of unofficial patches are slipstream like patches which combine official patches together, which are only available online or as small incremental patches. The most common case is that the source code and the original development tools are not available for the software. Therefore, the faulty software's binary must be analyzed at run time by reverse engineering and debugging. If the problem is found, a fix to the program must be applied. Sometimes only small changes in configuration files or the registry are required, sometimes binary hacks on the executable itself are required to fix bugs. If a software development kit (e.g. for modding) is available, fixes to the content can be easily produced, otherwise the community would need to create their own tools. These found fixes are typically packed to user deployable patches (e.g. with NSIS, Innosetup). If the source code is available, support can by provided most effectively. Sometimes the source code is released intentionally, sometimes by leaking or mistake, such as what happened with the game engine of the Thief series. Sometimes fans even completely reverse-engineer source code from the original program binary. With the source code available even the support of completely different but recent platforms with source ports becomes possible. While court cases directly involving unofficial patches are not existing, there were similar cases in court. The case of Galoob v. Nintendo found that it was not copyright infringement by a user to apply an unauthorized patch to a system (while the scope was very specific to the Game Genie). On the other hand, the case Micro Star v. FormGen Inc. found that user-generated maps were derivative works of the original game. In Sega v. Accolade, the 9th Circuit held that making copies in the course of reverse engineering is a fair use, when it is the only way to get access to the "ideas and functional elements" in the copyrighted code, and when "there is a legitimate reason for seeking such access". According to Copyright law of the United States 17 U.S. Code § 117, the owner of a copy of a program can modify it as necessary for "Maintenance or Repair", without permission from the copyright holder; an argumentation also raised by Daniel J. Bernstein professor at the University of Illinois at Chicago. Similar user rights are given also according to European copyright laws. The question if and which copyright holder unauthorized changes of lawfully obtained software are fair and beneficial, is a long-standing debate among academic scholars. An article of Helbraun law firm remarks in the context of fan translations that redistributing complete games with adaptions most likely does not fall under fair use, but in patch form it might fall under fair use, while this was never tested in court. Reception of unofficial patches is mixed, but by large, copyright holders are ambivalent. When the software is not considered commercially viable unofficial patches are ignored by the copyright holder as it is not seen as a source of lost revenue. There have been seldom cases of cease and desist letters to unofficial patch and fan translation projects. Sometimes the copyright holder actively support the patching and fixing efforts of a software community, sometimes even by releasing the source code under a software license which allows the software community the continued software support by themselves. Examples for such software are in the List of commercial video games with later released source code. The free and open source software movement was founded in the 1980s to solve the underlying problem of unofficial patches, the limited possibility for user self-support in binary only distributed software due to missing source code. Free and open source software demands from distributed software the availability of source code, which prevents the technical problems and legal uncertainties of binary only user patching of proprietary software. ^ a b Dirscherl, Hans-Christian (2005-11-29). "Nicht tot zu kriegen: Win 98 Service Pack 2.1" (in German). PCWelt.de. Retrieved 2011-04-06. ^ Cassia, Fernando (2007-03-28). "Open Source, the only weapon against "planned obsolescence"". theinquirer.net. Retrieved 2012-01-15. ^ g4tv staff (2011-05-30). "The Lost History of System Shock". g4tv.com. Retrieved 2012-05-30. Looking Glass Studios closed in 2000, a year after System Shock 2's release, and the copyright to the series went into the hands of an insurance company. That left EA with only the System Shock name, but no actual development rights. ^ a b Naraine, Ryan (2006-01-04). "IT Security & Network Security News - Another Unofficial WMF Patch Released". eweek.com. Retrieved 2012-01-07. Security vendor ESET, makers of the NOD32 anti-virus program, on Wednesday shipped an interim patch for the bug, almost a week before Microsoft Corp. is scheduled to release a properly tested security update. ^ a b Espiner, Tom (2006-01-06). "Firms urged to use unauthorised Windows patch". ZDNet.co.uk. Retrieved 2012-01-29. ^ a b CNN Staff (2006-01-03). "Huge virus threat rocks Microsoft". CNNmoney. Retrieved 2012-01-29. Because of the severity of the threat, the SANS Institute, a computer security group, has released a patch for the vulnerability until Microsoft's fix is available next week. ^ a b Sebayang, Andreas (2009-03-23). "Gothic 3 Community Patch soll fast alle Fehler beheben - mehr als 700 Veränderungen im letzten Community Patch" (in German). Golem.de. Retrieved 2011-04-03. ^ a b Sebayang, Andreas (2008-05-27). "High-Res-Patch für Command & Conquer 95 - Klassiker lässt sich nun in höherer Auflösung spielen" (in German). Golem.de. Retrieved 2011-04-03. ^ a b Moore, Bo (2013-11-19). "Is Your Game Crap? This Fan Will Fix It for You". Wired. Retrieved 2014-01-25. Thoman had uploaded “DPfix 0.1 alpha,” a patch that allowed Deadly Premonition players to manually adjust the game’s resolution. [...] The most recent DPfix release fixed pixel offset errors that occurred at higher resolutions, fixed anti-aliasing when it was not being correctly applied, added improved depth-of-field effects, and added an option for screen space ambient occlusion. ^ "Hacks - Bugfix". romhacking.net. Retrieved 2014-08-13. ^ a b Löding, Torge (2003-09-09). "Infogrames toleriert Fan-Übersetzung für Master of Orion 3" (in German). heise.de. Retrieved 2011-04-03. ^ a b Parkin, Simon (2008-12-26). "You Say Tomato: A Pro on Fan-Translating Nintendo's Mother 3". gamasutra.com. Retrieved 2011-04-03. ^ a b Wen, Howard (2004-06-10). "Keeping the Myths Alive". linuxdevcenter.com. Retrieved 2012-12-22. [...]fans of the Myth trilogy have taken this idea a step further: they have official access to the source code for the Myth games. Organized under the name MythDevelopers, this all-volunteer group of programmers, artists, and other talented people devote their time to improving and supporting further development of the Myth game series. ^ a b Largent, Andy (2003-10-08). "Homeworld Source Code Released". insidemacgames.com. Retrieved 2012-11-24. With the release of Homeworld 2 for the PC, Relic Entertainment has decided to give back to their impressive fan community by releasing the source code to the original Homeworld. ^ Bertolone, Giorgio (2011-03-12). "Interview with Kevin Klemmick - Lead Software Engineer for Falcon 4.0". Cleared-To-Engage. Archived from the original on 2011-03-18. Retrieved 2014-08-31. [C2E] In 2000 the source code of Falcon 4.0 leaked out and after that groups of volunteers were able to make fixes and enhancements that assured the longevity of this sim. Do you see the source code leak as a good or bad event? [Klemmick] "Absolutely a good event. In fact I wish I’d known who did it so I could thank them. I honestly think this should be standard procedure for companies that decide not to continue to support a code base." ^ Smith, Quintin (2010-12-14). "Dark Engine Source Code Found In A Bag". Rock, Paper, Shotgun. Retrieved 2011-04-15. As of this weekend, Christmas has come early for the Through the Looking Glass community. A CD’s been discovered containing the source code for the Dark Engine, aka the engine used by Thief, Thief II and System Shock 2 (not to mention Irrational and Looking Glass’ cancelled cold war spy game Deep Cover). ^ a b Grayson, Nathan (2012-09-26). "Hooray! – System Shock 2, Thief 2 Get Usability Patches". Rock, Paper, Shotgun. Retrieved 2012-11-16. Double Fine’s Chris Remo (via Kotaku) tweeted out word of the abruptly unearthed hunks of unofficial patching gold, pointing the way to a French forum called Ariane4ever. ^ a b "Le Corbeau" (2012-09-25). "Thief 2 V1.19 & System Shock 2 V2.4". ttlg.com. Retrieved 2012-11-10. This is an unofficial patch for Thief II: The Metal Age (T2) which updates the game from v1.18 to v1.19, providing improved support for modern hardware and correcting many known bugs. ^ "Dune Dynasty". Dune Dynasty is a continuation of the classic real-time strategy game Dune II by Westwood Studios. It is not a remake. It builds upon the original game engine as reverse-engineered by the OpenDUNE project. ^ Boulette, Bryan (2007-12-07). "E3 - Front Mission Interview". rpgamer.com. Archived from the original on 2011-05-25. Retrieved 2011-04-03. 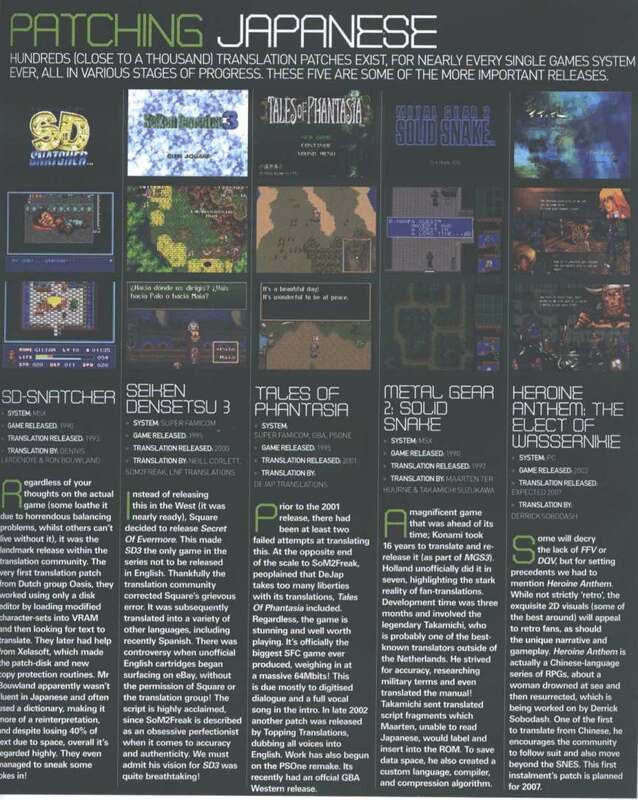 […]we told Mr. Sakamoto that a fan translation had been done some years ago for Front Mission 1, and asked how he felt about such efforts. The producer replied that he actually found them very encouraging -- it's something the developers should be doing, but because they're not, the fans are doing it instead. He stated that he'd like to be able to give something back to the fans, and would like to thank personally each of the fans that worked on the translation. ^ "Chrono Trigger Retranslation". chronocompendium.com. 2009-05-09. Retrieved 2011-04-03. As of May 9, 2009, the patch is no longer hosted due to a cease & desist letter from Square Enix. ^ Adamczewski, David (2001-11-21). "Infogrames lässt Übersetzung von Civilization 3 untersagen" (in German). heise.de. Retrieved 2011-04-03. ^ Bell, John (2009-10-01). "Opening the Source of Art". Technology Innovation Management Review. Retrieved 2012-12-30. [...]that no further patches to the title would be forthcoming. The community was predictably upset. Instead of giving up on the game, users decided that if Activision wasn't going to fix the bugs, they would. They wanted to save the game by getting Activision to open the source so it could be kept alive beyond the point where Activision lost interest. With some help from members of the development team that were active on fan forums, they were eventually able to convince Activision to release Call to Power II's source code in October of 2003. ^ a b Schramm, Peter (2010). "About MVG". madvulture.de. Archived from the original on 2011-03-26. Retrieved 2011-04-03. Being part of the “Community Patch Team” formed to fix the great but bug-baiten “Gothic 3″ game, Mad Vulture Games was taking care of major coordination work, 3D model fixing and lots of other work for the Gothic 3 Addon “Forsaken Gods” Enhanced Edition, also being the producing company. ^ "Anachronox - inoffizieller Patch" (in German). pcgames.de. 2003-05-27. Retrieved 2011-04-03. ^ Civ4: Better AI on sourceforge.net "Major improvements to AI naval and air unit handling [...] Well over 100 bug fixes"
^ Kosak, Dave 'Fargo' (27 October 2005). "GameSpy: Civilization IV". GameSpy. pp. 1–3. 662218. Archived from the original on 6 December 2013. Retrieved 24 October 2009. ^ Samuel Wicks (2016-04-26). "Wondrous: The Civilization V Community Patch Project". Rock, Paper, Shotgun. there’s another big new release expected, but it’s not an official expansion. It’s the Community Patch Project (CPP; to be named Vox Populi on release), a community-made mod that overhauls and improves a majority of the game’s systems in an attempt to make Civilization V the best game it possibly can be. ^ Charisius, Manuel (2010-07-20). "Chrono Trigger deutsch" (in German). manuloewe.de. Archived from the original on 2013-02-06. Retrieved 2011-04-03. ^ Smith, James E. (2010-02-22). "Command & Conquer retrospective part I - We take a look at the series that put RTS on the gaming map". www.mygaming.co.za. Retrieved 2011-04-12. Special Operations was unique to the Nintendo 64 and Playstation versions of the game, but the maps have since been extracted and included in unofficial fan patches. ^ "Command & Conquer Gold: Project 1.06". Nyerguds. 2014-07-08. Retrieved 2016-12-22. ^ theelderscrolls.wiwiland.net. "DaggerfallSetup". Retrieved 2011-02-25. ^ Klepek, Patrick. "Annoying Dark Souls 2 Glitch Has Gone Unfixed For Nearly A Year". Kotaku. There’s no excuse for the durability bug to be part of Scholar of the First Sin. It’s not limited to the PC version, either. The PlayStation 4 and Xbox One versions run at 60 frames-per-second. From Software and Bandai Namco have not yet responded to my request for comment. You might not be surprised to learn that fans have decided to rescue the game again, however. DS2fix removes the durability bug from the game, in addition to addressing a few other issues. ^ Baumgärtel, Tilman (2013-11-14). "Timothy Leary, der Games-Entwickler - Wie erhält man historische Computerspiele? Das Internet-Archive streamt Dutzende Klassiker" (in German). Die Zeit. Retrieved 2013-11-14. Beim Internet Archive ist nun nicht nur das Originalspiel [E.T. the Extra-Terrestrial] von 1982 zu finden, sondern auch eine Version, die seine schlimmsten Programmierfehler korrigiert. ^ "Fixing E.T. The Extra-Terrestrial for the Atari 2600". Neocomputer. 2013-02-01. Retrieved 2013-04-16. ^ Sines, Shawn (2008-01-08). "Fallout 2 Restoration Project". gamefront.com. Retrieved 2011-04-03. ^ Reindl, Walter (2004-06-29). "Freelancer - Großer Community-Patch erschienen" (in German). gamestar.de. Retrieved 2011-04-03. ^ Bradshaw, Dave (2011-11-25). "Baldur's Gate II Fixpack". gibberlings3.net. Retrieved 2012-02-03. The BG2 Fixpack is a WeiDU compilation of fixes for Baldur's Gate II. […] This collaborative effort, including the work of modders from several different modding communities and assistance from BG2 lead writer David Gaider, has resulted in a fixpack that currently includes all of the fixes addressed by Baldurdash (including the Game Text Update) and several hundred new bugfixes. The project is ongoing, and we're working through a substantial list of bugs culled from various sites, the old Baldurdash forums, and our own research. ^ Luke Plunkett (2018-02-28). "Mods Saved A Game, So They're Now An Official Product". kotaku.com. ^ Ancheta, Justin (2012-06-01). "Bringing Good Old Games To Modern Macs". Inside Mac Games. Retrieved 2014-03-29. Jagged Alliance 2 [...] and maintains both a tutorial for getting GOG games to run on Mac OS X, and a list of games he has personally tested to work on Mac OS X through CrossOver, Wineskin, and open source ports. ^ "Legacy of Kain: Soul Reaver - XP-Patch" (in German). pcgames.de. 2004-02-12. Retrieved 2011-07-17. ^ Raul, Cuban (2009-11-29). "Blood Omen: Legacy of Kain 2000/XP Update v2.0". comcast.net. Retrieved 2011-07-17. ^ wrace (2010-12-03). "Bink-support for BO1 (Video-Patch)". nosgothica.org. Retrieved 2011-07-17. […]now you can play in BO1 under Windows-7 without any problems with video. ^ Gantner, Michael (2010-12-23). "Lucasarts-Patches" (in German). gandimann.de. Retrieved 2011-05-28. ^ Robert Stiehl (June 8, 2010). "Master of Magic: Fanpatch behebt KI-Mängel". gamersglobal.de. Retrieved 2016-07-15. ^ kyrub (2011-10-24). "MoM insecticide patch (latest version) - 28/06/2012 Latest version here: MoM unofficial patch 1.40n". realmsbeyond.net. Retrieved 2012-07-14. What the Insecticide patch is all about? to make the MoM game as bug-free and as AI-challenging and as user-friendly as possible without modifying the content. The patch now features more than 200 bug-fixes, AI improvements and interface changes. ^ Wiesner, Thorsten (2003-09-10). "Deutsche Fan-Übersetzung zu Master of Orion 3 ist fertig" (in German). golem.de. Retrieved 2011-04-03. ^ "ZipCode: Endportal Malfunction (Fixed Version: 1.6)". ^ "ZipCode: Netherportal Malfunction (Fixed in 1.7)". ^ "ZipCode: Inconsistent Timing Bug (Fixed in 1.8)". ^ O'Connor, Alice (2016-06-25). "Nuclear Throne Mod Adds Online Co-op". Rock, Paper, Shotgun. Retrieved 2017-01-05. ^ Fenlon, Wes (2016-06-27). "Nuclear Throne online co-op mod is just as fast and deadly as playing offline". PC Gamer. Retrieved 2017-01-05. ^ Sharkey, Mike (2012-03-14). "Unofficial Skyrim Patch Fixes Myriad Skyrim Bugs - Fan created uber patch designed to fix Skyrim's many problems". gamespy.com. Retrieved 2012-12-22. ^ "Skyrim - Director's Cut" (in German). scharesoft.de. Archived from the original on 2012-11-13. Retrieved 2012-12-22. Die Erweiterung Skyrim - Director's Cut hat es sich zum Ziel gemacht, die deutsche Version von The Elder Scrolls V: Skyrim so gut es geht zu verbessern. Vorrangig geht es darum, fehlende Übersetzungen nachzuholen und Texte und Begriffe so anzupassen, dass sie auch zu den vorherigen Teilen der Reihe passen. Mit dem beiliegenden inoffiziellen Skyrim-Patch werden zudem eine Vielzahl Fehler des eigentlichen Spiels, die die offiziellen Patches noch nicht korrigiert haben, behoben. Mit der Erweiterung könnt ihr außerdem alle englischsprachigen Texturen nun in deutscher Sprache vorfinden. ^ Thompson, Michael (2009-10-06). 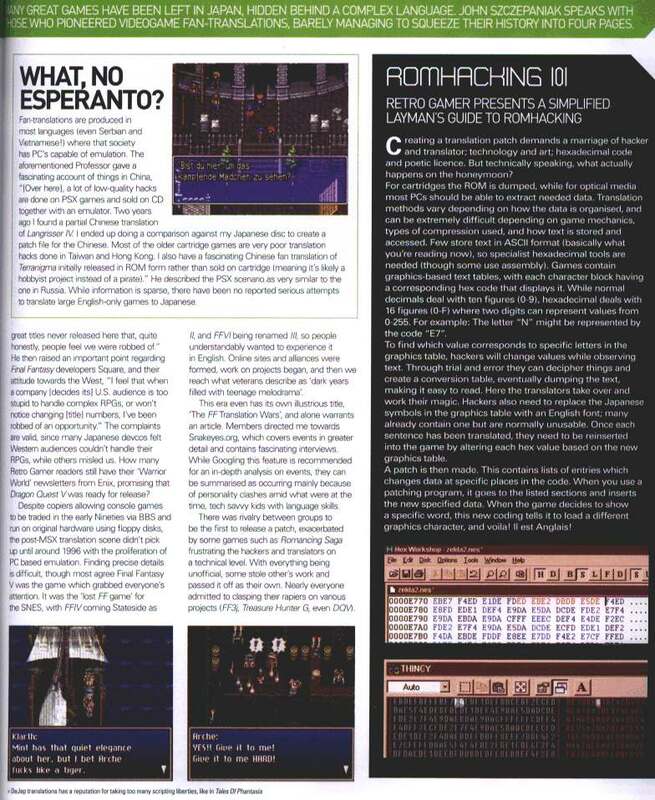 "Fan-restored KOTOR II content creates refined, expanded game KOTOR II wasn't the most complete Star Wars title ever released, due to an …". arstechnica.com. Retrieved 2013-09-05. After years of development, the cut content has been finally restored and the most of the bugs have been fixed, thanks to a project known as known as the "Restored Content Mod. ^ Grayson, Nathan (2012-08-24). "Get These: KOTOR 2 And Its Restored Content Mod". Rock, Paper, Shotgun. Retrieved 2013-09-05. On top of that, the mod fixes “over 500″ bugs, because Obsidian, basically. ^ Wilde, Tyler (2012-07-26). "Community heroes: modders debug and restore cut content in Knights of the Old Republic II". PC Gamer. Retrieved 2012-09-26. ^ Tsai, Andrew (2013-01-03). "The Fixer: How To Restore Knights of the Old Republic II". Rock Paper Shotgun. Retrieved 2013-01-28. ^ "PC gamer pod cast 87". Retrieved 2013-08-25. ^ Hafer, T.J. (2012-11-19). "Community-made Forged Alliance Forever keeps Supreme Commander multiplayer alive". PC Gamer. Retrieved 2014-08-28. The official multiplayer servers for Supreme Commander: Forged Alliance have been decommissioned for a while now, but fortunately [...] the community-driven Forged Alliance Forever has emerged. The self-patching multiplayer client allows players of the epic real-time strategy title to continue blowing things up in massive quantities. It even adds new units, a new faction, and some game modes that weren't available on the official servers, such as 6v6. ^ yerkyerk (2009-06-03). "Titan Quest bugfix patch 1.17a". titanquest.net. Archived from the original on 2012-04-06. Retrieved 2012-07-27. ^ spectre (2012-02-06). "(REL) Patchfix for Fanpatch 1.17 (v1.17c)". titanquest.net. Archived from the original on 2012-07-01. Retrieved 2014-09-21. ^ Voyager (2007-04-08). "Ultima The Reconstruction - Fanpatches". reconstruction.voyd.net. Retrieved 2011-05-28. ^ Neuhaus, Hanno (2010-11-12). "Vampire 2: Bloodlines - Community-Patch 7.2 zum Download" (in German). gamestar.de. Retrieved 2011-04-03. ^ Haas, Pete (2009-07-03). "Vampire: The Masquerade - Bloodlines Still Getting Patches". GAMING BLEND. Retrieved 2012-01-07. ^ "Community Coder Program!". goldhawkinteractive. Retrieved 2015-07-09. ^ "What is Xenonauts: Community Edition & how do I get it?". goldhawkinteractive.com. Retrieved 2015-07-09. ^ Leyden, John (2009-02-24). "Unofficial patch plugs 0-day Adobe security vuln. - Mind the gap". The Register. Retrieved 2013-07-09. Updated Security researchers have developed an unofficial patch for a zero-day Adobe Acrobat and Reader vulnerability that's become the subject of hacker attacks. Adobe acknowledged the vulnerability last week but said an official patch wouldn't be available until 11 March. ^ Kaplan, Dan (2012-08-27). "New Java exploit on the loose, unofficial patch may help". scmagazine.com. Retrieved 2013-07-09. ^ Kuhbach, Sebastian (2005-08-04). "Inoffizielles Win98 SE Service Pack - neue Version" (in German). winfuture.de. Retrieved 2011-04-06. ^ "48-bit LBA Tools & Drivers". fryeware.com. 2005. Retrieved 2011-04-06. Win98: Enable 48-bit LBA patch for Windows 98 posted on MSFN.ORG - Implements 48-bit LBA support into Windows 98's default IDE driver to support hard drives larger than 137GB. ^ Turner, Neil (2010-05-17). "Resurrecting a dead OS with KernelEx". Neil Turner's blog. Retrieved 2011-04-06. ^ Tiensivu, Aaron (2009-04-09). "KernelEx - run XP/2K apps on Win98 and WinME". Aaron Tiensivu's Blog. tiensivu.com. Retrieved 2011-04-06. This is a fascinating project from a technical standpoint. They are implementing missing API calls used by newer applications that are missing from Windows 98 and Windows ME. ^ Vahldiek, Axel (2007-03-20). "Microsoft geht gegen unautorisierte Update-Packs vor" (in German). heise online. Retrieved 2011-04-06. ^ "Inoffizielle Patch-Pakete für Windows 2000 und XP (Update)" (in German). Golem.de. 2005-11-10. Retrieved 2011-04-06. ^ Abazovic, Fuad (2006-11-17). "Nvidia cuts Vista support for Nforce 2 chipset - Fare thee well, old friend". www.theinquirer.net. Retrieved 2011-05-28. ^ Fernando (2011-02-07). "XP: Optimized nForce Driver Packs". Archived from the original on 2012-11-23. Retrieved 2011-05-28. Many users with an nForce chipset mainboard, who are running or going to install Windows XP (32/64bit), are searching for actual nForce chipset drivers, which are suitable for their special chipset and will give them the best possible performance and stability of their system. NVIDIA itself doesn't offer them. ^ AdvModDev (2008-01-13). "nForce 123/WinXP Chipset Drivers and Remixes". Retrieved 2011-05-28. ^ Kennedy, Erik (2007-01-28). "An unofficial Daylight Saving Time fix for Mac OS X 10.3". Ars Technica. Retrieved 2012-01-29. This page was last edited on 27 December 2018, at 22:51 (UTC).